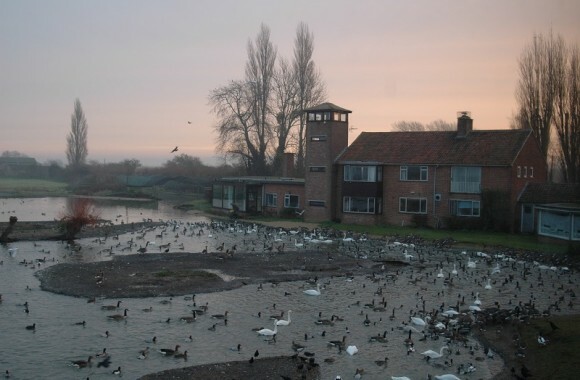 The house at Slimbridge Wildfowl and Wetlands Trust (WWT) was built for Sir Peter Scott, artist, conservationist and broadcaster, who lived there for over thirty years. The house closely reflects Scott’s life and personality. It is a house to look out from rather than to look at, and it is the features that enable the outward facing prospect that make the building revealing of its extraordinary occupant. Built in the 1950s the house is an odd mix of the remarkable and unremarkable. 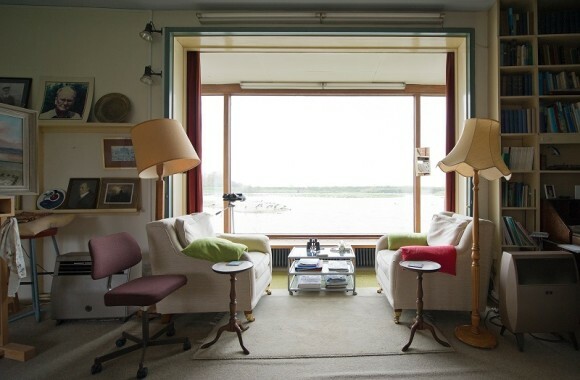 A plain domestic home is combined with a studio featuring a large picture window overlooking an artificial duck pond. The studio itself is big, almost the same size as all the rest of the ground floor of the house. Connected to the house by a passage are a large staff hostel and laboratory wing, a conversion of an L-shaped cow byre done contemporaneously with the building of the house. The observation tower, and a now derelict swimming pool were added several years after the main house was completed. 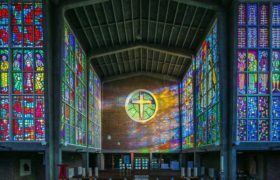 The architect was Scott’s friend Peter Bicknell (1907-1995), the two men having met as students at Cambridge. Bicknell combined academic teaching with writing and was a partner with H.C. Hughes in an architectural practice known mainly for educational buildings. Scott was closely involved in the design process and all the house’s distinctive features are attributable to him. In a letter to Bicknell in 1952, Scott wrote: “I fear you may find us tiresome folk to build a house for – too many bight ideas”. A flow of “bright ideas” was the mark of much of Scott’s correspondence to Bicknell with Bicknell providing the expertise and technical skills to realize them. The studio and pond were early requests and planned together. Writing to Bicknell, Scott said: “I have two wild ideas which you might think about. The best view from the studio will be half right. Would it be feasible to put the main window across the corner and bulging out so that one can see round the corner each way, or would it look terrible from the outside? The second idea is that a concrete pond of irregular shape should come to the foot of the window so that one could feed the ducks on the water from one hand out the window. Fun?” Scott wanted the studio widow to have a north-facing vista for light purposes as much as prospect. 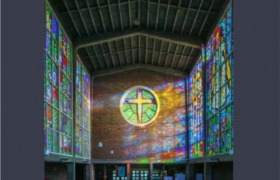 He liked “most to paint a picture in which I am looking into the source of light – and if it is reflected in water, so much the better.” Bicknell achieved the preferred view by designing the studio on a curve and projecting its huge plate glass window (ten feet by eight) from the building so that Scott could see out from each side. The sidelights were fitted with French windows for feeding ducks. Scott’s inspiration for the studio window was a glass-enclosed veranda he had seen in Quebec in 1938. From this veranda Scott had watched snow geese in their thousands and marvelled at how close he had been to these wild birds. The studio window with adjacent pond allowed him the same experience. He would sit with his easel or sketchbook by the window and watch the wildfowl gathered on the lake outside within a few feet of the studio wall. Later the studio also became the set for some of Scott’s TV wildlife broadcasts. In 1975 Scott broached the possibility of an observation tower for the house with Bicknell, including in his letter some initial sketches. Like the studio window, Scott had taken the idea of an observation tower long before. His first adult home had been a lighthouse and he had admired a hundred-foot-high tower at the Migratory Bird Refuge on the delta of the Great Bear River in Utah in 1948. In 1977 when Scott, along with Jacques Cousteau, was awarded the International Pahlavi Environment prize, worth $50,000, for ‘the most outstanding contribution in the field of the environment” Scott pledged nine-tenths of his share to conservation causes, keeping the remainder for “a few small comforts for our home”. He put the money towards building the tower. It is the house’s most distinctive external feature, and in appearance and position is remarkably close to one of Scott’s sketches. 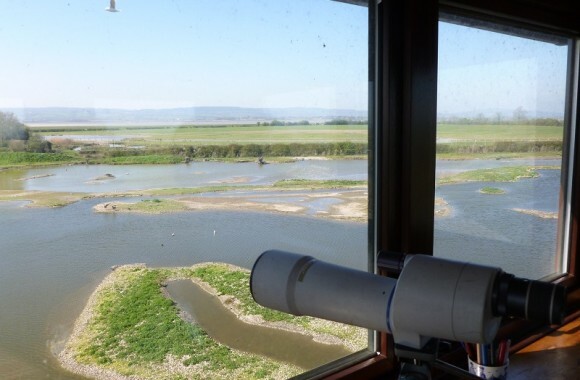 From the observation room at the top, is a view across the Slimbridge wetlands to the far side of the River Severn and the Forest of Dean. Scott loved towers and they have become an iconic feature of the WWT reserves with one incorporated into every visitor centre. After Scott’s death in 1989, his widow continued to live in the house until her death in 2010. 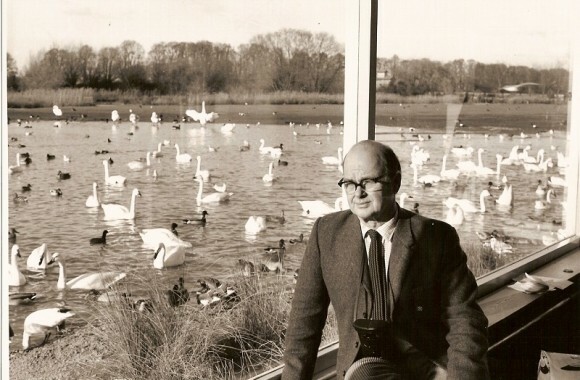 At her request, the Chief Executive of Slimbridge, Martin Spray, began to use the studio as his office. He has changed almost nothing. Scott’s personal belongings, sketchbooks and paintings, including the one he was working on when he died, still fill the studio. The rest of the house remains in a similar condition, even down to the fine details. A visitor book sits near the front door, full of Scott’s sketches and the vast collection of signatures of people who visited the Scott family, amongst them the Queen and Prince Philip. Scott rarely threw anything away. His papers and belongings are spread out across the different WWT centres (nine nationally in total), as well as some being held within private collections and at Cambridge University. The Trust is currently seeking funding to produce a comprehensive catalogue for all Scott’s extant possessions. Scott, P (1952-1975) Peter Scott Home and Household. Peter Scott Collection. A/654 – A/673. Cambridge Manuscripts Library. Cambridge.